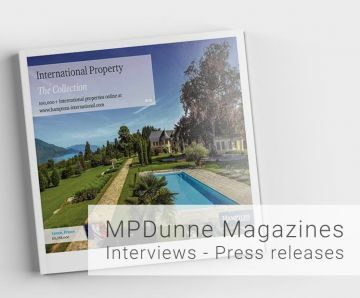 Too many real estate agencies view themselves as sales operations, but at MP Dunne we regard ourselves as a professional service provider with real estate and market expertise that brokers between seller and buyer. Most forms of brokerage therefore need to be proficient, and in the case of real estate this covers topics from professional valuations and legal conveyance to fiscal and investment parameters, planning laws and all the other factors involved in the buying and selling of homes, commercial property and land. We provide a lot of this information in-house, as well as drawing on our in-depth knowledge of this region’s property market. In addition, we have built up a network of distinguished professionals in the legal, financial and surveying fields, with whom we work and to whom we feel we can refer clients with complete peace of mind. The same applies to banks and architects, as we work with people that stand out for their expertise, customer service and ability to solve problems when they arise. We also always try to find you a professional that knows how things work here but also speaks your language. In all of this we are happy to provide a support role, offering information, advice and references to professional services when needed. What’s more, this is a service that functions purely as an extension of our real estate role and is aimed at informing and supporting our clients, so we don’t receive commissions for referrals. As a result, our only criterion is finding you the best professional advice available.